Strangely enough, as I was progressing into the second trimester, I was starting to feel more normal physically on a day to day basis. I was no longer feeling a slight sense of nausea and I wasn’t falling asleep on the couch in the middle of the day for no apparent reason. Although I was feeling better in my day to day life, my body was taking much longer to recover from hard rides. Even if the ride was a short one, if the effort was relatively tough, the next day my legs would feel very fatigued. I would notice a burning sensation in my quadriceps when walking upstairs or even if I was just out for a very easy spin on my bike. 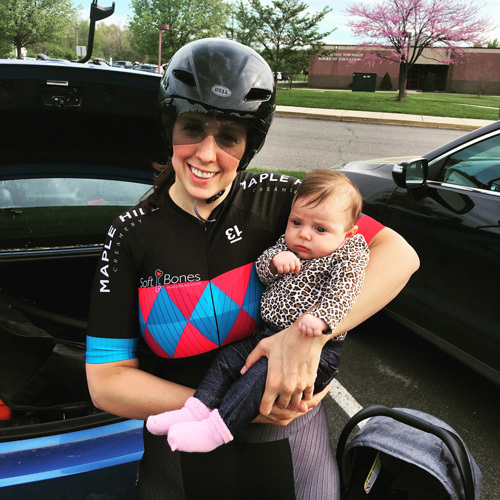 Before becoming pregnant I would ride five or six days per week, and while I did feel tired at times I could handle hard efforts on back to back days. Now I was finding that I had to truly plan for those harder efforts. If I knew I was going to do a hard group ride on a Tuesday, I would have to really take it easy on the days leading up to that ride to make sure my legs were ready for the effort. I engaged in this kind of planning in my training before pregnancy, as most athletes should, with some hard days, some easy days and some rest days, however, I found that now I needed way more easy days and rest days to prepare for the one hard ride during the week. Initially, I found this limitation frustrating. I’m not sure what I expected to happen as I became more and more pregnant. I knew that I would need to cut back at some point, but as that need became a reality I was having trouble accepting it. As I continued to progress through the weeks getting closer and closer to week twenty I began to relax a bit more and just be grateful that I was still riding my bike outside. I was still putting in one hundred miles or more per week at this point which was something to celebrate. If you are a pregnant athlete, cut yourself some slack and accept the fact that your body won’t respond the same way it did before becoming pregnant. Remember that your body is building and protecting another human and so some resources that used to be devoted to building muscle and recovery are now being dedicated to building that tiny human. In addition, as you enter the second trimester your heart begins to work approximatley forty percent harder to pump more blood than before and so your heartrate will be higher even during moderate efforts. Made it up to the cider mill at fifteen weeks pregnant. 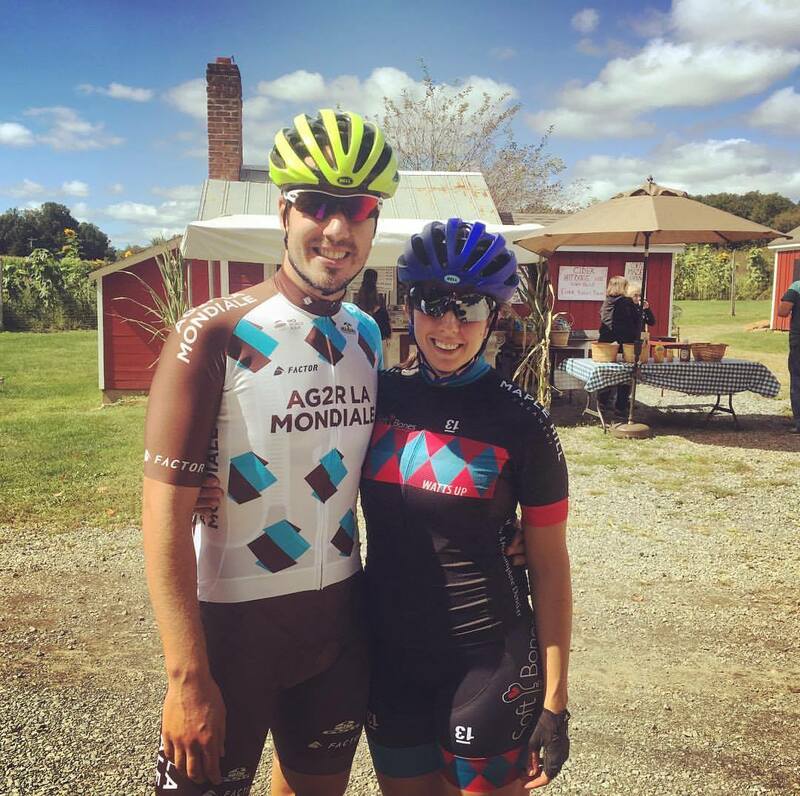 During week fifteen I planned my annual autumn ride to the local cider mill. 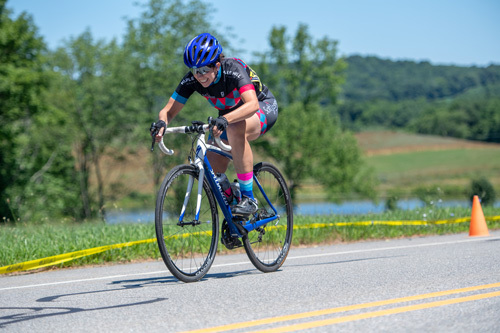 There is no quick and easy way to ride to the cider mill from home and so before my body changed too dramatically, I took on the challenge of riding the fifty-something miles with at least one very challenging climb. I recruited a few good friends to join me on my quest for endurance miles, cider and donuts. I wasn’t sure I would make it up the arduous climb that led to the cider mill (known to the locals as Black River Road), as it has a steep section of just under mile in length which maxes out at around a seventeen percent grade. Needless to say, I climbed very slowly with some extremely heavy breathing, but in the end, I made it to the top to get my reward of fresh cider and donuts. This small victory of conquering the climb up to the cider mill made me feel as good as if I had ridden up Alpe d’Huez. At week eighteen, I was still able to get out for a somewhat hilly forty-mile ride. Climbing those hills was becoming more and more difficult as my power was continuing to decrease and my weight increase. While I wished I was still in peak climbing form, it was a beautiful day and I was just appreciative that I could do a ride of that length at week eighteen of my pregnancy. As I got into the middle of week nineteen I was starting to feel a bit more uncomfortable on my road bike at times. Riding in the aggressive road position was making my abdomen feel like it was being squished and my breathing was becoming more labored even during moderate efforts. I began to realize that I might have to transition to a less aggressive bike in the new few weeks if I wanted to continue riding outdoors at all. I had hoped to get out for one more forty or fifty-mile ride, but I realized at this point that I might be done with my longer rides for the time being. I love being outdoors for hours and hours on my bike on the weekends, but for the next few months I was going to have to settle for an hour or two at a time. Twenty weeks pregnant, still riding my bike and starting to show. If you love to ride you don’t have to give it up the minute you become pregnant. You don’t even have to give it up for a decent period of time into the pregnancy. It’s all about what you feel comfortable with. 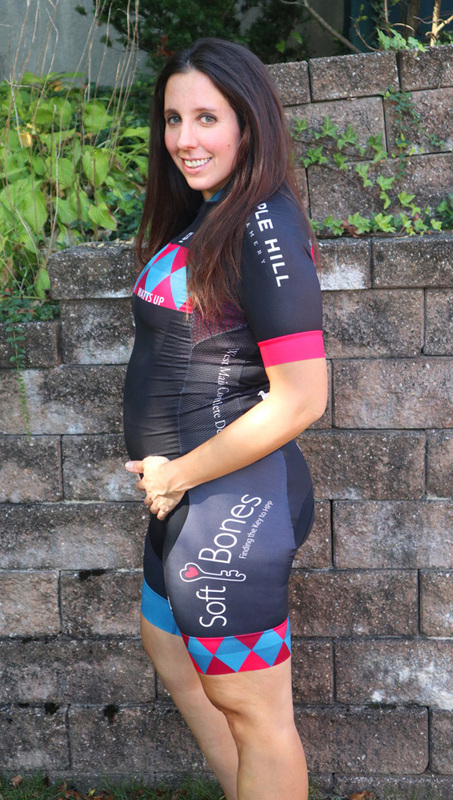 Some women may be too nervous to ride outdoors at all while pregnant and that’s completely fine. People kept asking me when I was going to stop riding and the answer was that I was going to do it as long as I felt comfortable. If I felt like I was losing my balance and endangering myself and the baby of course I would stop, but up until this point I didn’t have those feelings. I had been so concerned that I was going to have to give up cycling altogether the minute I found out I was pregnant, but here I was, past the midway point of the pregnancy, still riding my bike. I felt good for the most part and definitely well balanced and comfortable on the bike in regard to my center of gravity. The more difficult part was shifting my mindset to enjoying the ride and not worrying about speed or distance or the fact that I might be the last one to reach the top of a hill. The autumn weather was beautiful, I was still staying active doing what I loved and that was what really mattered. Soooooo Is Excited for you both!!! It is a different perspective to be the LAST up that Hill … but you are riding TANDEM! !